Apple® today released Safari® 5, the latest version of the world's fastest and most innovative web browser, featuring the new Safari Reader for reading articles on the web without distraction, a 30 percent performance increase over Safari 4,* and the ability to choose Google, Yahoo! or Bing as the search service powering Safari's search field. Available for both Mac® and Windows, Safari 5 includes improved developer tools and supports more than a dozen new HTML5 technologies that allow web developers to create rich, dynamic websites. 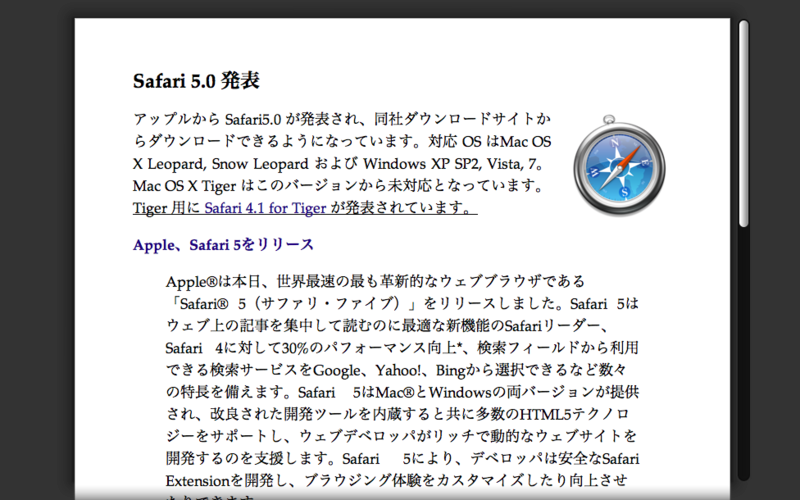 With Safari 5, developers can now create secure Safari Extensions to customize and enhance the browsing experience.